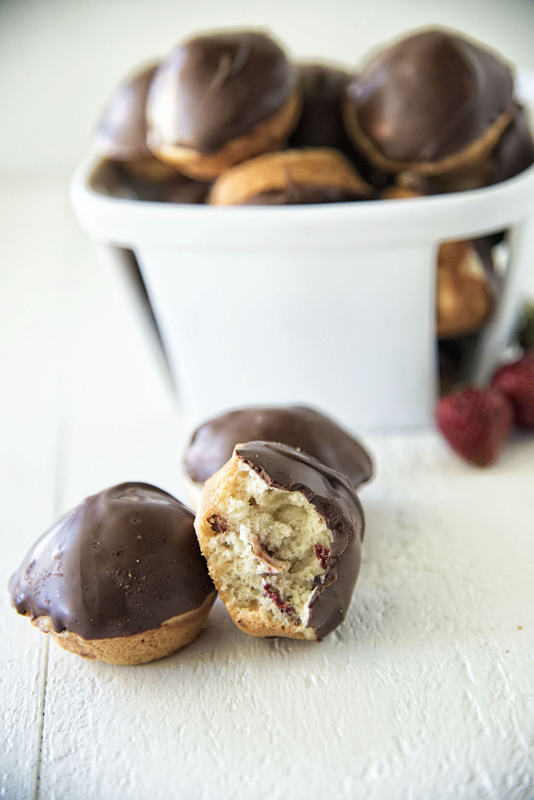 Chocolate Covered Strawberry Muffin: These mini muffins are buttermilk based, filled with freeze dried strawberries and mini chocolate chips, and then dipped in a chocolate coating. Now some might say because these muffins have a chocolate coating that they are not muffins. I try not to listen to those people. This recipe was actually created about a year ago but I used fresh strawberries. The problem I found with the strawberries was that they were too juicy and so if you did not eat the muffins in one sitting (which I applaud you if you rise to that challenge and indeed eat them all in one sitting) then they got bad really fast. Like quickly growing mold on them fast (after one day), especially since it is warm outside. But I liked the idea and so I decided to tweak the recipe to include freeze dried strawberries. Then again there are people who eat blue algae so maybe I was just making them even healthier for you. Bahaha. 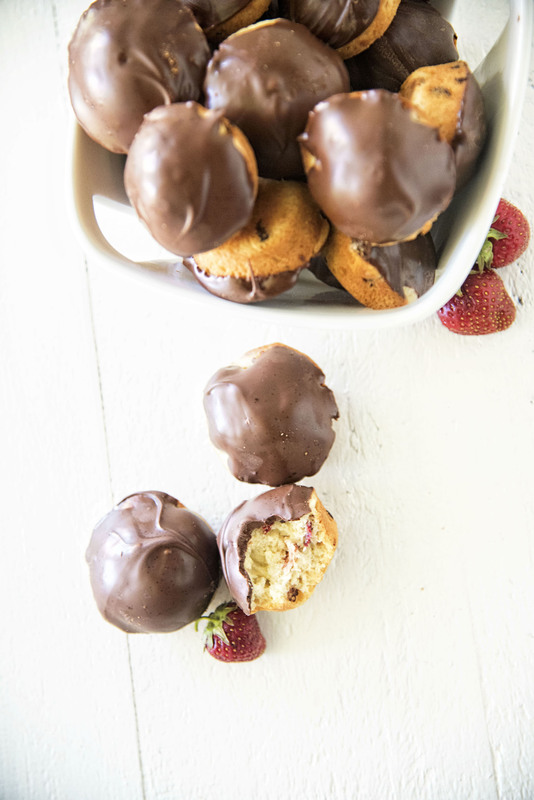 I chose to make these as mini muffins because I like that they are more the size of a chocolate covered strawberry that way. However, you could easier make them larger by simply adding more baking time, I am guessing about 22-24 minutes. If you have a Trader Joe’s near you they carry freeze dried strawberries. Bulk is the way I go since I used freeze dried fruit often because it stores well and can easily be turned into a powder which is great when making frosting. Prepare two mini muffin pans with baking spray. In another bowl, whisk eggs, buttermilk, vanilla, and oil together until fully combined. Fold in freeze dried strawberries and chocolate chips. 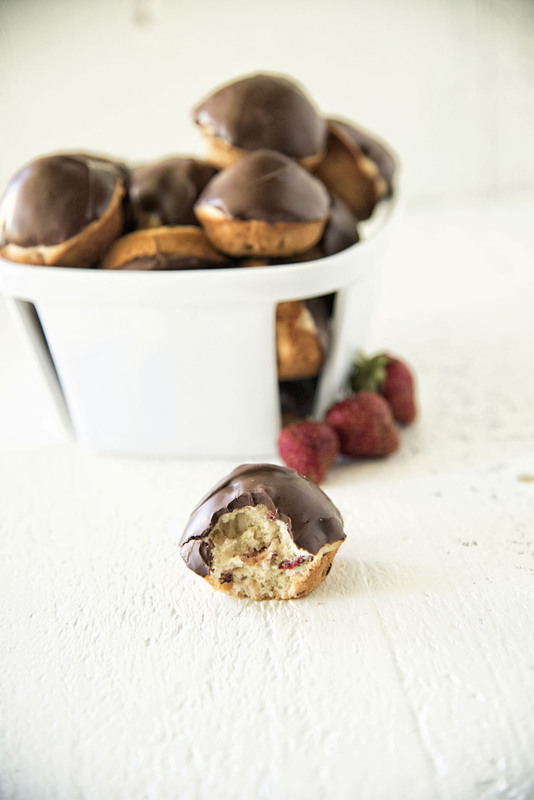 Dip the top of each muffin into the chocolate and set on a wire rack with a cookie sheet below to catch any drips. Let the muffins stand at room temperature until the coating hardens.